Some people dream of a Caribbean cruise. In our family, we prefer rivers. There’s no sea sickness, and the shoreline is always in sight — which is huge when you factor in swim time from a disabled ocean liner. Paranoia aside, a river cruise is also more intimate and affordable than ocean travel, without giving up meals or comfort. A perfect two-day “sampler” is the Twilight riverboat cruise on the Mississippi between Le Claire, Iowa, and Dubuque. You may know Le Clair as the quaint river town where “American Pickers” (History Channel) is filmed but it’s also a burg with a mean brat and beer — the heartland’s answer to white wine and sushi. Cruising the river that Mark Twain called home is pure pleasure on Twilight, a vessel he would have likened to a floating palace. 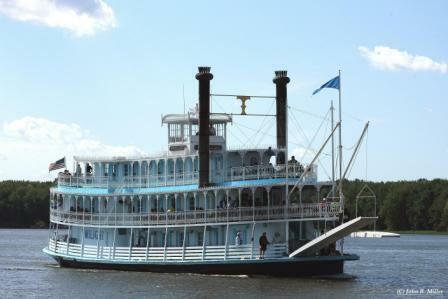 All gussied up with ornate promenades and stained glass windows, locals say she’s the most elegant riverboat launched in the past 100 years. The decks are bedecked with big rocking chairs — perfect for watching life on the river unfold. And unlike the ocean, life can be kind of quirky on a river. Twilight Capt. Kevin Stier says he once saw a bunch of street artists on a chain of rafts motored by a Volkswagen engine. “They got caught in a storm, and their barge broke in half, and they lost their bicycles, and they lost their speakers, and, by the time they got to Lock 13, half of them were so scared they went home,” Stier says. From cargo barges to canoes, all manner of vessels float by the Twilight, while majestic bald eagles and divebombing pelicans soar overhead. Great blue herons perch on sandbars and stumps, thought by some to be reincarnated river boat pilots pointing out hazards. On the banks stand proud river towns with their aging brick factories and soaring church steeples, beckoning travelers to tie up and taste life the way Twain might have remembered it. The Mississippi River is an iconic piece of American history. No ocean or sea can match what she has to offer — as a highway, a flyaway vacation, and a source of food, energy and recreation. The Twilight details can be found at www.riverboattwilight.com.